This small and compact amplifier is designed specifically for the Yaesu FT-817 QRP radio. The amplifier incorporates a newly developed and advanced microprocessor to control the operation of the amplifier including smooth automatic band switching. In addition, manual band switching is also possible via the front mounted controls. Operation with other brands and models is possible, but manual band tuning and construction of an interface cable, specific to your radio, would be required. A hard keying circuit guarantees smooth and effortless T/R switching with the radio. Also incorporated is an ALC circuit, which will help insure that the finals are always protected from being overdriven, which could result in premature failure of the finals and/or signal distortion. The amplifier incorporates various protection circuits such as high SWR, Over Drive, Over Current, etc. Any fault encountered by the unit will cause an immediate shut down of the amplifier protecting sensitive components. 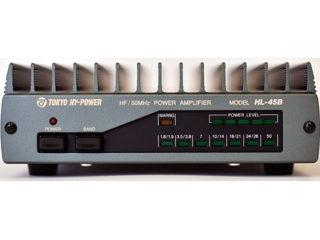 This amplifier can be successfully used with other QRP rigs such as the ICOM 703, though automatic band switching will not be available and the band must be manually selected via the front band select switch. Mounted on the front panel is a row of 7 LED's which indicate the active band. To the top is a 5 segment LED power meter. On the left side of the power meter is a fault warning LED indicator. There are also two mounted switches, a power switch and a manual band select switch. The rear connections include, DC Power connection terminals, Remote jack (which connects to the ACC jack on the FT-817 containing connections for ALC, T/R switching, and band data for automatic band switching), transmitter input and antenna output coaxial connections.